Seasteaders say such autonomous floating cities would foster faster development of techniques "to feed the hungry, cure the sick, clean the atmosphere and enrich the poor". Some critics fear seasteads are designed more as a refuge for the wealthy to avoid taxes or other problems. As an intermediate step, the Seasteading Institute has promoted cooperation with an existing nation on prototype floating islands with legal semi-autonomy within the nation's protected territorial waters. On January 13, 2017, the Seasteading Institute signed a memorandum of understanding (MOU) with French Polynesia to create the first semi-autonomous "seazone" for a prototype, but as of 2019 its status was uncertain. The Principality of Sealand, a micronation formed on a decommissioned sea fort near Suffolk, England. Floating communities, such as the Uru people on Lake Titicaca, the Tanka people in Aberdeen, Hong Kong, and the Makoko in Lagos, Nigeria. The Republic of Rose Island, a short-lived micronation on a man-made platform in the Adriatic Sea, 11 kilometres (6.8 mi) off the coast of the province of Rimini, Italy. Pirate radio stations anchored in international waters, broadcasting to listeners on shore. At least two people independently coined the term seasteading: Ken Neumeyer in his book Sailing the Farm (1981) and Wayne Gramlich in his article "Seasteading – Homesteading on the High Seas" (1998). Gramlich’s essay attracted the attention of Patri Friedman. The two began working together and posted their first collaborative book online in 2001. Their book explored many aspects of seasteading from waste disposal to flags of convenience. This collaboration led to the creation of the non-profit The Seasteading Institute (TSI) in 2008. In March 2019, a group called Ocean Builders claimed to have built the first seastead in International Waters, off the coast of the Thai island of Phuket. Thai Navy officials have charged them of violating Thai Sovereignty. Friedman and Gramlich noted that according to the United Nations Convention on the Law of the Sea, a country's Exclusive Economic Zone extends 200 nautical miles (370 km) from shore. Beyond that boundary lie the high seas, which are not subject to the laws of any sovereign state other than the flag under which a ship sails. They proposed that a seastead could take advantage of the absence of laws and regulations outside the sovereignty of nations to experiment with new governance systems, and allow the citizens of existing governments to exit more easily. "When seasteading becomes a viable alternative, switching from one government to another would be a matter of sailing to the other without even leaving your house," said Patri Friedman at the first annual Seasteading conference. The project picked up mainstream exposure after having been brought to the attention of PayPal cofounder Peter Thiel. Thiel donated $500,000 in initial seed capital to start The Seasteading Institute, and has contributed $1.7 million  in total to date. He also spoke out on behalf of its viability in his essay "The Education of a Libertarian". As a result of Thiel's backing, TSI received widespread media attention from a variety of sources including  The Economist Business Insider, and BBC. Would place a floating city within the international legal framework. On January 13, 2017, French Polynesia Minister of Housing, Jean-Christophe Bouissou signed a memorandum of understanding (MOU) with TSI to create the first semi-autonomous "seazone". TSI spun off a for-profit company called "Blue Frontiers", which will build and operate a prototype seastead in the zone. The prototype will be based on a design by marine engineering firm Blue 21. On March 3, 2018, a mayor from French Polynesia said the agreement was "not a legal document" and had expired at the end of 2017 in response to a challenger trying to make it an issue for the May, 2018 elections. Cruise ships are a proven technology, and address most of the challenges of living at sea for extended periods of time. However, they're typically optimized for travel and short-term stay, not for permanent residence in a single location. Blue Seed retro-fitted cruise ship. András Győrfi's "The Swimming City"
The Floating City Project / Blue Frontiers. AT Design Office floating city concept. Blueseed was a company aiming to float a ship near Silicon Valley to serve as a visa-free startup community and entrepreneurial incubator. Blueseed founders Max Marty and Dario Mutabdzija met when both were employees of The Seasteading Institute. The project planned to offer living and office space, high-speed Internet connectivity, and regular ferry service to the mainland but as of 2014 the project was "on hold". The Seasteading Institute held its first conference in Burlingame, California, October 10, 2008. Forty-five people from nine countries attended. The second Seasteading conference was significantly larger, and held in San Francisco, California, September 28–30, 2009. The third Seasteading conference took place May 31 – June 2, 2012. Jules Verne's 1895 science-fiction book Propeller Island (L'Île à hélice) is about an artificial island, Standard Island, designed to travel the waters of the Pacific Ocean. Waterworld was a major motion picture featuring various seastead communities. In video games, a city on the ocean free from any kind of government is the premise of the games BioShock and BioShock 2, Brink, and Call of Duty: Black Ops II; while in Metal Gear, a private military company maintains its Mother Base on the ocean, independent from any government. In the Gathering Storm expansion for Civilization VI, seasteads are a tile improvement gained in the future era. Transhumania is a seasteading city in the novel The Transhumanist Wager by Zoltan Istvan. The Neal Stephenson book Snow Crash takes place partly on Rife's Raft, a floating refugee camp of boats and rafts tied together. Gargantia on the Verdurous Planet is a Japanese anime that takes place mainly on a traveling city made of an interconnected fleet of ocean ships. Armada is the fictional floating city in China Miéville's novel The Scar. ^ Griffiths, Sarah (2015-07-08). "Will cities of the future FLOAT? $167 million project using concrete platforms could be home to 300 people by 2020". Daily Mail. Retrieved 2017-01-31. ^ Zolfagharifard, Ellie (2017-01-17). "Plans for world's first 'floating city' unveiled: Radical designs could be built in the Pacific Ocean in 2019". Daily Mail. Retrieved 2017-01-31. ^ a b c Wong, Julia Carrie (January 2, 2017). "Seasteading: tech leaders' plans for floating city trouble French Polynesians" – via www.theguardian.com. ^ "Helen Clark, an election, and a very fast drive to the football". Crikey. August 10, 2005. ^ Mangu-Ward, Katherine (April 28, 2008). "Homesteading on the High Seas: Floating Burning Man, "jurisdictional arbitrage," and other adventures in anarchism". Reason Magazine. Retrieved 2009-02-28. ^ a b Carli, James (December 10, 2016). "Oceantop Living in a Seastead - Realistic, Sustainable, and Coming Soon". Huffington Post. Retrieved 2017-01-25. ^ a b BBC, News (January 17, 2017). "French Polynesia signs first floating city deal". BBC. Retrieved 2017-01-25. ^ "Vincent Callebaut Architecte LILYPAD". callebaut.org. ^ Rose, Steve (August 25, 2008). "The man who saw the future". The Guardian. London. Retrieved May 23, 2010. ^ "12 Post-Apocalypse Floating Cities and Homes: From Crazy Concepts to Reality". TreeHugger. ^ "Explorers in the Valley still charting new territory". The Irish Times. 19 September 2008. ^ "SeaSteading -- Homesteading the High Seas". gramlich.net. ^ Fingleton, Eamonn (March 26, 2010). "Seasteading: the great escape". Prospect Magazine. Retrieved 2017-01-31. ^ Gramlich, Wayne; Friedman, Patri (2002). "Getting Serious About SeaSteading". Andrew House. Retrieved 2017-01-31. ^ "Seasteading couple charged as Thai navy boards floating home". ABC News. 2019-04-21. Retrieved 2019-04-21. ^ a b Baker, Chris (January 19, 2009). "Live Free or Drown: Floating Utopias on the Cheap". Wired Magazine. Retrieved 2009-01-19. ^ a b c d e f "Cities on the Ocean". The Economist. 3 December 2011. Retrieved 6 December 2011. ^ "Peter Thiel Makes Down Payment on Libertarian Ocean Colonies". WIRED. ^ "City floating on the sea could be just 3 years away". CNN. March 3, 2009. Retrieved 2009-03-10. ^ May Young, Niki (May 22, 2008). "The Seasteading Institute established to develop permanent ocean communities". World Architecture News. Retrieved 2009-02-28. ^ Wang, Brian (January 13, 2017). "Peter Thiel on Trump, Seasteading and making futures more like the Jetsons or Star Trek". Next Big Future. Retrieved 2017-01-30. ^ Peter Thiel (April 13, 2009). "The Education of a Libertarian". ^ "Seasteading: the great escape". Prospect Magazine. April 2010. ^ "Seasteading Misconceptions - Business Insider". Business Insider. 16 November 2013. ^ "BBC - Future - Ocean living: A step closer to reality?". BBC Future. ^ Stossel, John (11 February 2011). "Is Seasteading the Future?". ^ Adam Frucci. "Silicon Valley Nerds Plan Sea-Based Utopian Country to Call Their Own". Gizmodo. Gawker Media. ^ "Libertarian Island: No Rules, Just Rich Dudes". NPR.org. 21 May 2008. ^ "Meetup.com - October 2010 Seasteading Social at the Hyatt Regency SF". Retrieved 20 October 2010. ^ "Seasteading: A Possible Timeline". Archived from the original on 29 November 2010. Retrieved 20 October 2010. ^ a b Gramlich, Wayne; Friedman, Patri; Houser, Andrew (2002–2004). "Seasteading". seasteading.org. Archived from the original on 2009-02-10. Retrieved 2009-02-28. ^ a b "ClubStead". seasteading.org. 2009. Retrieved 2009-06-02. ^ Charlie Deist. "The Seasteading Institute". The Seasteading Institute. ^ "Floating City Project - The Seasteading Institute - Startup Cities". The Seasteading Institute. ^ "Start". Startup Cities Institute. ^ "Designing the Worlds First Floating City - Indiegogo". Indiegogo. ^ "Government of French Polynesia Signs Agreement with Seasteaders for Floating Island Project | The Seasteading Institute". www.seasteading.org. Retrieved 2017-02-05. ^ Megson, Kim (2017-01-24). "French Polynesia could host world's first floating city after signing agreement with Seasteading Institute". CLADnews. Retrieved 2017-02-03. ^ "French Polynesia sinks floating island project". Radio New Zealand. February 28, 2018. ^ a b c Donald, Brooke (16 December 2011). "Blueseed Startup Sees Entrepreneur-Ship as Visa Solution for Silicon Valley". Huffington Post. Retrieved 12 March 2011. 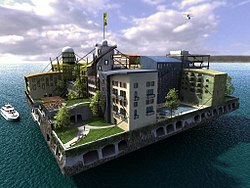 ^ "World's first floating city back on course". NY Daily News. Retrieved 2017-02-07. ^ McCullagh, Declan (February 2, 2009). "Next Frontier: "Seasteading" The Oceans". CBS News. Retrieved 2009-02-28. ^ "Oil Platforms Transformed into Sustainable Seascrapers- eVolo - Architecture Magazine". evolo.us. ^ "Apply Seasteading Concrete Shell Structures - The Seasteading Institute". The Seasteading Institute. Archived from the original on 2010-07-10. ^ "Floating City Project | The Seasteading Institute". www.seasteading.org. Retrieved 2017-02-05. ^ "Oceanscraper- eVolo - Architecture Magazine". evolo.us. ^ "Floating City concept by AT Design Office features underwater roads". Dezeen. ^ "Seascraper – Floating City - eVolo - Architecture Magazine". evolo.us. ^ a b Raj, Ajai (2014-06-14). "A SPACESHIP FOR THE SEA". Popular Science. Retrieved 2017-02-04. ^ a b Lee, Timothy (2011-11-29). "Startup hopes to hack the immigration system with a floating incubator". Ars Technica. Retrieved 30 November 2011. ^ "Blueseed - Lessons learned four years later". October 26, 2015. ^ a b c d Denuccio, Kyle. "Silicon Valley Is Letting Go of Its Techie Island Fantasies". WIRED. Retrieved 2017-02-01. ^ "Seasteading Institute 2008 Annual Report" (PDF). TSI. April 15, 2009. Archived from the original (PDF) on April 19, 2009. Retrieved 2009-08-12. ^ "Seasteading 2009 Annual Conference". TSI. August 10, 2009. Retrieved 2009-08-12. ^ McCullagh, Declan (2009-10-11). "Seasteaders Take First Step Toward Colonizing The Oceans". CBSNews. Retrieved 2009-10-12. ^ Wilkey, Robin (June 4, 2012). "Seasteading Institute Convenes In San Francisco: Group Fights For Floating Cities (PHOTOS)" – via Huff Post. Look up seasteading in Wiktionary, the free dictionary.